More than a year on from the birth of Prince George the world is gearing up for the birth of another royal heir, this time in Monaco. Prince Albert II of Monaco and his wife Princess Charlene attend the annual picnic in 'Le Parc Princesse Antoinette' in Monaco yesterday, once again giving the excited population – and world’s media- a glimpse of the Princess’s burgeoning baby bump. The 36-year-old royal certainly seems to be enjoying an early pregnancy glow, looking tanned and radiant at her husband’s side holding a delicate bouquet of pink and white roses. yes really she always looks sad - wonder if it is just her expression - is she really that depressed? baby bump!! and she almost looks happy ! I think is more strange this pregnancy than kate's!!! She will give birth in december! This is the archive of articles that concern Charlene of Monaco. His twins are yet to leave hospital but Prince Albert of Monaco is taking fatherhood in his stride if this morning's visit to a nursery is any indication. The royal, 56, was at the nursery to play Father Christmas to an excited group of children and was all smiles as he handed out prettily wrapped gifts. But there was no sign of his wife, Princess Charlene, 36, who remains in hospital with their baby twins Jacques and Gabriella. Yes, very pregnant and lovely, she has that dreamy look a lot of pregnant women have, as if she is inside herself and happy about it. Many don´t but I quite like her, and at least she tries most of the time, unlike some others we could mention. Princess Charlene of Monaco celebrates her 37th birthday on 25 January. The elegant wife of Prince Albert is expected to mark the day privately with her husband and their six-week-old twins, Prince Jacques and Princess Gabriella. To honour the occasion, HELLO! Online has gathered a list of ten facts you may not have known about the royal. This is a really interesting picture of Charlene. Very, very modern looking. I've not come across it before. She is wearing the Ocean necklace as a tiara. It's a beautiful jewel and whatever people think about the relationship between Charlene and Albert, he did put a lot of thought into that gift. It's not like the blue precious ring that was picked out of a selection. 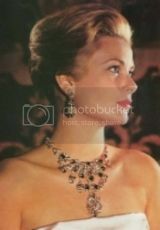 It was specially made by Van Cleef & Arpels. I don't think the marriage is that bad between them since no matter what, a woman even at that level can escape and live her own life. If Diana can, anyone can. She seems a bit like Princess Diana in that she has found a look that suits her, and a hair style, and has really worked hard at getting it right this last few years. She wears her jewellery well to, quite fitting for the position she now has in life. Her jewels certainly far exceed anything wasty has managed to get her claws on. I love the way that Charlene wears colours that would not normally suit her colourings. The colour of the dress below and the shiny material would be a bit full on for her colouring. She is not wearing it close to her face and is wearing the Ocean necklace. The material on the bodice is more muted so she gets away with the shiny skirt. IMO she is the best dressed royal.